Build a canvas app to manage data that's stored in Common Data Service, using standard entities (which are built in), custom entities (which your organization creates), or both. 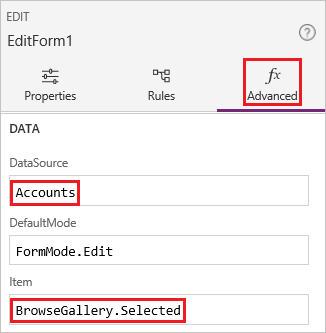 When you build an app from Common Data Service, you don't need to create a connection from PowerApps, as you do with data sources such as SharePoint, Dynamics 365, or Salesforce. 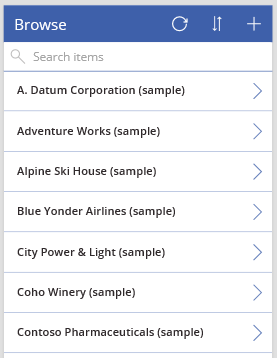 You need only to specify the entities that you want to show or manage in the app. Before you create an app from scratch, familiarize yourself with PowerApps basics by generating an app and then customizing that app's gallery, forms, and cards. Switch to an environment in which a database has been created with sample data. If you have an appropriate license, you can create an environment to meet this need. To create an app, you must be assigned to the Environment Maker security role. 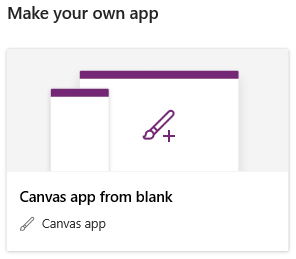 Under Make your own app, select Canvas app from blank. Specify a name for your app, select Phone, and then select Create. You can build an app from scratch for tablets, but this topic shows building an app for phones. In the middle of the screen, select connect to data. 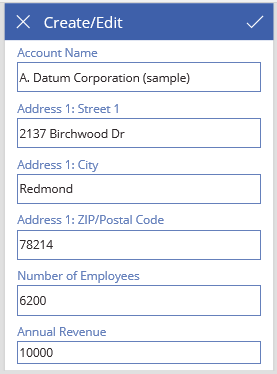 In the Data pane, select Common Data Service, select the Accounts check box, and then select Connect. Close the Data pane by selecting the close icon in the upper-right corner. 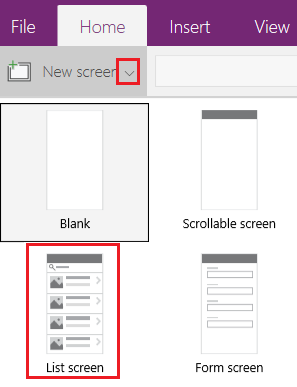 On the Home tab, select the down arrow for New screen, and then select List. The gallery should show data from the Accounts entity. The data should be sorted in ascending order until a user selects the sort button to toggle the sort order. If a user types or pastes one or more characters into the search bar (TextSearchBox1), the list will show only those accounts for which the name field contains the characters that the user specified. You can use these and many other functions to specify how your app appears and behaves. Set the gallery's layout to show only the name of each account, and configure the title bar to show the word Browse, as Customize a gallery describes. In the left navigation bar, hover over Screen1, select the ellipsis icon (...), and then select Delete. In the left navigation bar, hover over Screen2, select the ellipsis icon (...), and then select Rename. Type or paste BrowseScreen, and then rename the gallery in that screen as BrowseGallery. Repeat the first step of the previous procedure, except add a Form screen instead of a List screen. Set the form's DataSource property to Accounts and its Item property to BrowseGallery.Selected, as the Advanced tab of the right-hand pane shows. On the Properties tab of the right-hand pane, select Edit fields to open the Fields pane. Set the title bar's Text property to show Create/Edit. The screen reflects your changes. On the Insert tab, select Icons, and then select the Trash icon. In the left navigation bar, select BrowseScreen, and then open Preview by pressing F5 (or by selecting the play icon near the upper-right corner). Toggle the list between ascending and descending sort orders, and filter the list by one or more characters in the account name. Add an account, edit the account that you added, start to update the account but cancel your changes, and then delete the account. Link this app to a solution so that you can, for example, deploy it to a different environment or publish it on AppSource. Open one or more sample apps, and explore different types of apps that you can create.